spoke to the crowd about our graduate degree program. Last Tuesday, we hosted a reception on campus to celebrate the launch of Graduate Studies at Peirce -- a milestone in the history of the College. Trustees, alumni, staff, faculty, and members of the extended Peirce community came together to learn more about the program and to meet faculty and staff members. We were very pleased with how the event turned out and wanted to share some snapshots of the night here on the blog. Of the 93 attendees, we were pleased to see 52 alumni members and their guests; many members from our Board of Trustees; three former Board chairs; four students already accepted to the program; and a host of faculty, staff, and friends of the College. Many of our guests hadn't had the chance to visit campus for a while, so the reception gave them the opportunity to see the physical improvements we've made and celebrate a new chapter in our history. Jim Mergiotti opened up the night's program by speaking about the master's degree program and what it means for the College. Pat Rucker then provided insights into how this program represents the College taking the next steps in higher education. I was honored to speak as well, and covered the academic nature of the program and how a master's degree in Organizational Leadership & Management can benefit students in their current career, or in the future. We then heard remarks from Steven Rodriguez, an alumnus of the College and one of the first accepted into our graduate program, and concluded the evening with time for discussion. We caught many of these moments on camera, so flip through the slideshow to see some photos. Our friends at WURD 900 AM also broadcasted live from our lobby, and interviewed three of our accepted master's program students, as well as a current Peirce undergrad student. Pat and I were also interviewed, which was a lot of fun. 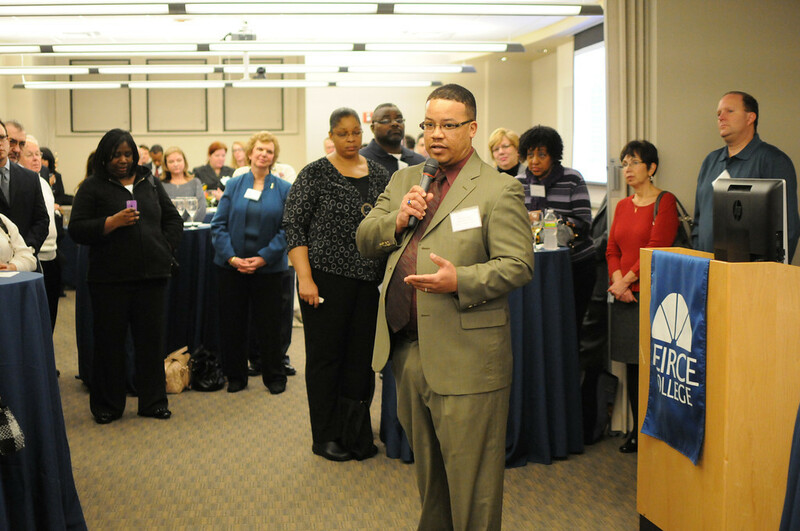 We've been working on creating a master's degree program that fits the needs of working adults in Philadelphia for some time now, and this event was truly a celebration of that. 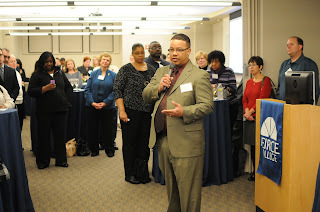 The reception also had special meaning for me, as it was the first event I've attended at Peirce. I felt very welcomed and honored to be a part of this community, and I look forward to leading the Graduate Studies program to help professionals advance their careers and continue their lifelong learning journeys. We'll be hosting more events surrounding our graduate programs in the future, so keep checking back to the blog and the Peirce website for updates. If you want to learn more about our master's degree program, or want to submit your application to be a part of the inaugural class, visit our website or contact the Graduate Studies Admissions Office at Masters@Peirce.edu or 215.670.9325.